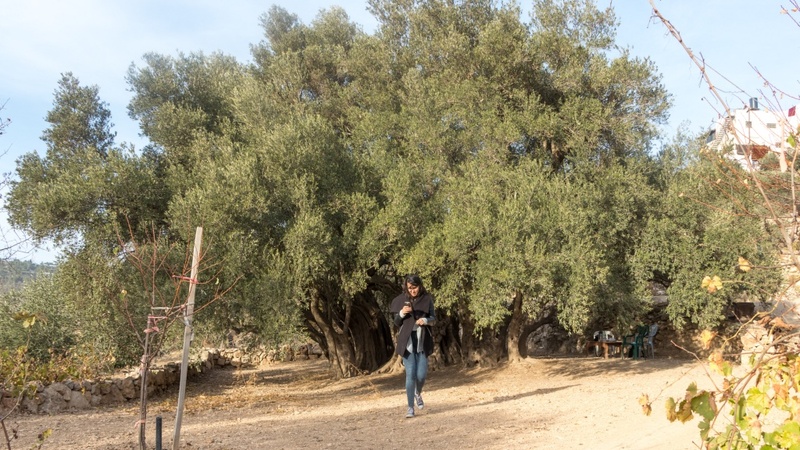 In the beautiful village of Walaja just between Jerusalem and Bethlehem, a valley rich with fruit trees, a small path descends away from the houses and into the orchards. A special breeze gathers along the route. If you follow it, you will likely be accompanied by birds as you walk along ancient stone walls that traverse the valley, passing a spring that still spouts water into a stone cistern. 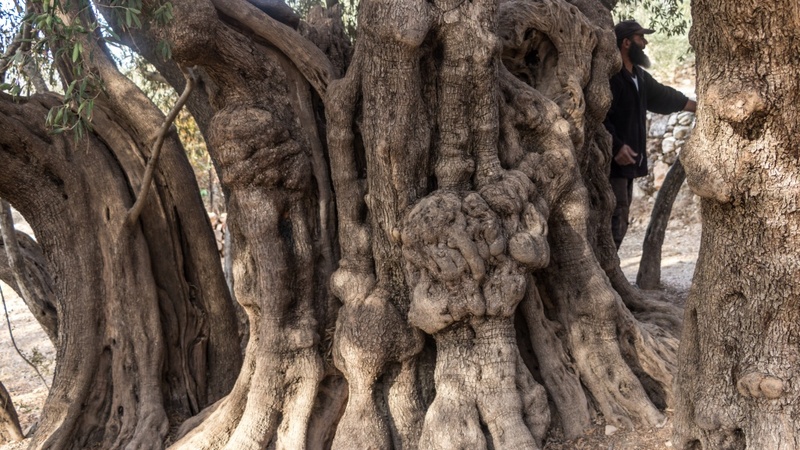 Continue just a little bit, and you will arrive at what Palestinians believe to be the oldest olive tree in the world, the Badawi tree. Some say that the Badawi tree is four thousand years old, others five thousand, others only a thousand. No one really seems to know. But everyone agrees that the al-Badawi tree is a deep part of the local heritage. Schoolchildren come to visit it. Old men walk here to sit under its branches. I first learned about it from my own students, who spoke of an ancient Palestinian tree that they had heard stories about in their childhood. The tree is carefully guarded, in a fenced off area and behind a locked gate. If you call out, as I did, a man will come and unlock the gate for you. He is Salah Abu-Ali, and I ask him if he is the guardian of the tree. He corrects me. “No, I am the servant of the tree,” he says. The tree itself is massive and full of character, extremely wide, with knots in the trunk that are half my size and huge roots that sink into the ground. Seemingly impossibly, the ancient branches still sprout fresh green leaves, as the tree still produces olives during olive season. Beit Jala, which is nearby, is purported to have the best olive oil in all of Palestine. 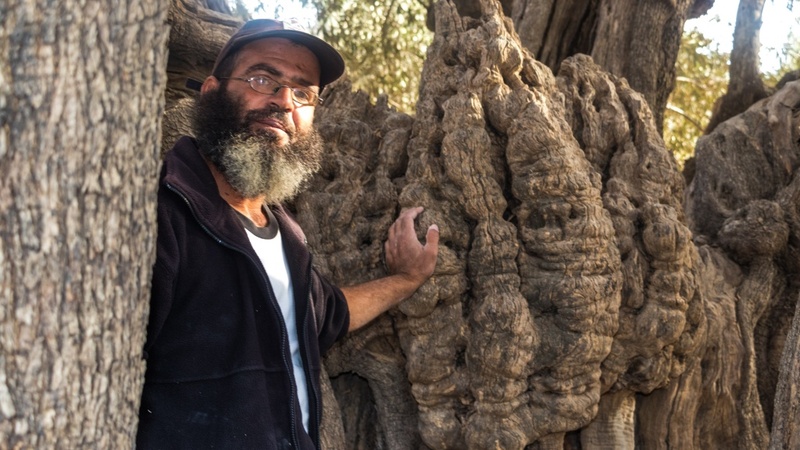 Abu Ali insists that the oil from the al-Bedawi tree is the finest in the country, with a unique taste different from that of other trees. While some people claim that the tree is named after a villager from several centuries ago named al-Badawi, it seems more likely that the tree is named after the famous Islamic wali, or holy man Ahmad al-Badawi, who lived in the 13th century. Born in Fez, Morocco, he spent a prolonged period in Mecca before he eventually made his way back to Egypt, where he founded one of the largest Sufi orders in Egypt, whose influence was felt throughout the region. Whoever al-Badawi was, locals in al-Walaja believed he spent a prolonged period resting under their tree, so long that the tree came to take his name. Later his followers gathered under the tree, where tradition says they would make food to be distributed to the poor. His tree became a holy place, not only a tree but a maqam or shrine. “God blessed this place,” Abu Ali says.